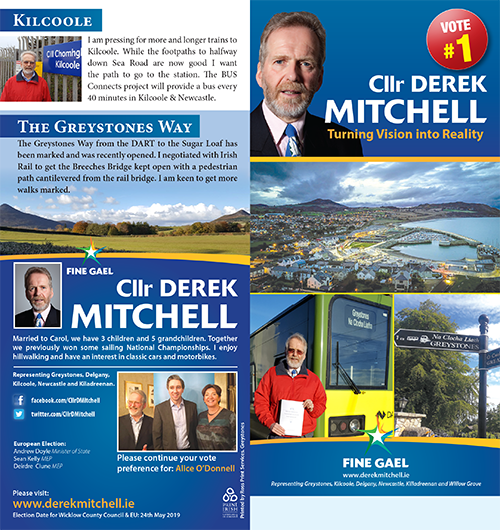 Other issues which I have worked on; Park n’ Ride site, Greystones Way & other walks, footpaths, bike racks at DART, protecting Bray Head, new schools, St. Patricks Day parade, Swimming Pool & Sports hall. Greystones area. The Train & Bus services have recently been reduced causing extra traffic jams. Councillors Proposals to get people back on to Public Transport. I spent 22 years campaigning to get the DART to Greystones. Wrote 40 page document ‘Rail Options for Greystones ’which the Managing Director of Irish Rail said had studied it in greater depth than they had. Organised 1993 Greystones DART march when 220 people marched to the Department of Transport. Pressed for more trains to Kilcoole. I got land reserved for the 500 space car park. By far the largest on the DART line and about the only one that is free. Greystones has more parking than any other comparable town. This is organised by Greystones Town Council which is to be abolished in May 2014. I have helped organise the parade for 14 years. It is the only event which gets most people in the area onto the street together. I am keen to ensure it continues under the new Council arrangements. In 2007 the harbour was derelict, whereas now it is the best leisure harbour in Wicklow and the 4th best nationally, after Dun Laoghaire, Cork and Howth. Increasing numbers of local rowers, sailors, anglers and Sea Scouts young and old are enjoying the facilities. I have led this process for 12 years as I believe that as a sea town we should have a major and appropriate presence on the sea. 600 yachts, with 2000 on board, have been able to visit the town in 2013 now that it finally has a proper harbour. They have come from Ireland, Wales, England, France & Belgium. Most stay the night and spend heavily, increasing the trade in pubs and restaurants. They have been very pleased with the marina, the closeness and quality of pubs, restaurants and coffee shops. Many more are expected next year now that word is spreading in the sailing community. In July, I sent a list to the developer of 5 improvements which should be done to the site and for Summer 2014, the developers have now agreed to most of these. These will improve the appearance of the area by opening the North Pier and opening and grassing more of the Public Square. The Council is asking them to further improve the grass area behind the fencing and some other items. I am keen to see completion of the project soon. I have a deep knowledge of the sea and am keen to continue working on it. I would be happy to give a detailed talk about this exciting harbour project to any group that would be interested. A month after being elected in 1999 I found out the procedure to get a pool and got the Council to produce a feasibility study. Many groups and people helped and eventually it was built. Its great to see so many people using it now. I helped push through the rezoning which got the town the site for the 3 new schools at Blacklion. At the time this was controversial but I was convinced that these schools would be needed even though the Department of Education initially ignored this need. I also wanted a Primary School on zoned land beside Charlesland but the Department ignored this. So many children could have walked or cycled safely to a school in Charlesland where now they will probably be driven, as the school was not approved. It is very important to keep this green and unspoilt. About a decade ago I got it accepted that the only new building allowed between the main road and the sea would be those for active farmers. I dont think there has been any new buildings since then and it still looks very unspoilt. There is a proposal for a windfarm on the Bray and Kish Banks off Greystones. This will be very visually intrusive, occupying a 62 degree arc of view and is close to shore. I have objected to their licence application. The Codling Bank proposal will be much less intrusive as it has only a 25 degree arc of view and is 5km further offshore. It will provide jobs in Co. Wicklow unlike the Bray/Kish one. I did not object to their licence as it seems much better. Going South there are regular traffic jams in the evening back to Cherrywood and increasingly in the mornings going North back to Willow Grove. Of the 6 big radial roads out of Dublin, this is the only one which has not been modernised. It needs to be modernised as it is vital for the prosperity of East Wicklow. In the long run it needs a third lane. Southbound, improving the off/on ramps at Fassaroe, reducing the number of exits (4 in a mile) and rearranging the Kilcroney roundabout to lights or preferably a small flyover. This junction is very unusual as traffic exiting a main road normally leaves before the junction. Here you go under the flyover and turn back. This creates extra traffic ‘conflicts’ at the roundabout and thus leads to queuing on the N11 to exit. Northbound. Widening and improving the Kilcroney junction. Separating a lane for traffic from Kilcroney to Enniskerry Junction and from there to Fassaroe. Merging/Demerging slows down traffic leading to it bunching up. Most of the above items are designed to speed up merging so through traffic slows down less. Improvements are also needed in Kilmacanoge. The Minister for Transport has agreed to meet me and I intend to push these points which have stalled because of a row between the National Roads Authority and the Council. There is a plan to build a large town of 25,000 people at Cherrywood which would further block the N11/M50. I have asked Bord Pleanala to put in a condition that the N11 must be improved first. I made a presentation at the Oral Hearing 6 months ago but a decision has been postponed indefinitely. Wrote a study jointly with the Greystones Chamber of Commerce on providing an Enterprise Centre for start up firms. This formed the basis for agreeing with the Charlesland developer to donate a 3,000 sq.m. one to the town. This is now held up due to the recession. I have pushed for footpath and road improvements. For years I demanded that the Delgany By Pass be built and eventually this was done. The road section from the N11 and around the National School has been improved. I am pushing for the rest to be improved. Playground. After much pressure from myself, the 2008 Plan rezoned land on the Sea Road for housing, on condition that an acre of land was given for a playground. Progress has been slow but I hope that the land, opposite Wellfield, will be given to the Council soon. The Council currently has most of the €100,000 needed to build the much needed and long awaited playground. Sea Road Path. Walking to the beach and station needs to be made safer. I pushed hard and got this listed as an objective in the 2008 Plan. Following years of pushing I got the short stretch at the top of the road completed. It will be difficult to get adequate width to build the rest of it but the design is now being worked on. I will be pushing to get funding to build it in 2014. A path is also needed to the GAA Club. Community Centre. The Council has about €180,000 to contribute towards building or extending the Community Centre. Legal issues are being resolved and plans should progress after that. For 9 years worked to get the path from the village to the school. Children from Church lane can now walk down to get the school bus to Kilcoole. I worked to get the road to the N11 improved so there would be a footpath but this has not proved possible so far. Helped the Community Centre initiate the playground.